Kale is the new black - or maybe the new green? No matter. Kale has finally asserted its place in the food world and it's not going anywhere fast. Kale is high in beta carotene, vitamin K, vitamin C, and antioxidants, just to name a few. This dark leafy green should be incorporated into your diet whether it's in the form of a crunchy kale chip or simple kale salad like the ones below. If you're afraid of kale, these delicious recipes will give you an introduction to just how wonderful kale can be. When kale is mixed with other greens, it adds texture to the salad and a nutritional boost. This grilled chicken and nectarine balances mildly flavored Romaine lettuce with kale. You can easily substitute the grilled nectarine for another grilled stone fruit like peaches or apricots. Gluten-free and vegetarian, this three bean kale Greek salad is packed with protein and flavor. Kale is a heart green so it can stand up to bold ingredients and dressings like this tahini vinaigrette. This salad is mxed with Kalamata olives, red onion, tomatoes, feta cheese and an array of beans. 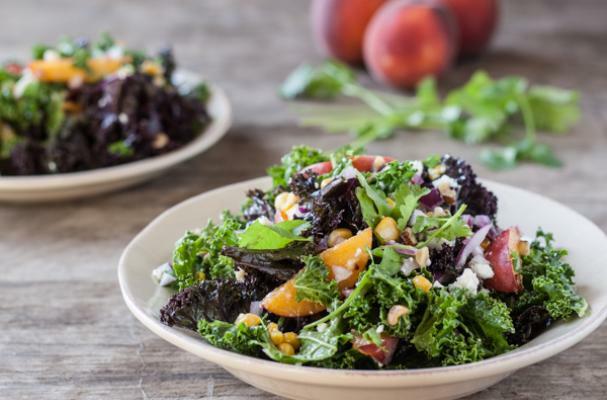 This peach, corn and kale salad is summer in a bowl. The fresh seasonal ingredients play well together in this salad, especially when dressed with a lime cumin vinaigrette. The warm cumin compliments the sweetness of corn and peaches and tames the kale.